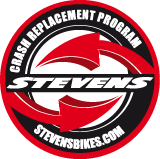 STEVENS-Crash Replacement Program for racing or MTB frames applies when you crash or get involved in an accident with your STEVENS bike and offers you the opportunity to buy a replacement frame at a 50% special discount on the current retail price, if the old one is beyond repair. The complete bike or single frame must have been bought at an authorized STEVENS dealer. The offer is valid for 2 years starting from purchase date. The defective frame must be sent in via a STEVENS dealer including proof of purchase and damage report. The replacement frame is suggested/offered by STEVENS in consultation with the dealer (it may occur that the same color or version is not available due to a model change). Frames that already had been replaced or for which warranty claims were made are excluded from this program. This offer does not apply to damage through negligence or willful intent. STEVENS does not pay the retrofitting and transport cost.